DUBLIN (CNS) — Thousands of pro-life demonstrators held a candlelight vigil outside the Irish parliament Dec. 4, calling on the government not to introduce abortion legislation. An estimated crowd of 8,000 people braved bitterly cold weather to hear speakers from a coalition of pro-life organizations call on Irish Prime Minister Enda Kenny to keep a pledge made before the 2011 general election not to introduce such legislation. The protest came a week after Kenny promised “swift action” on study group recommendations that the government introduce legislation to provide for abortion in limited circumstances. The government has promised to respond formally to the issue before Christmas. 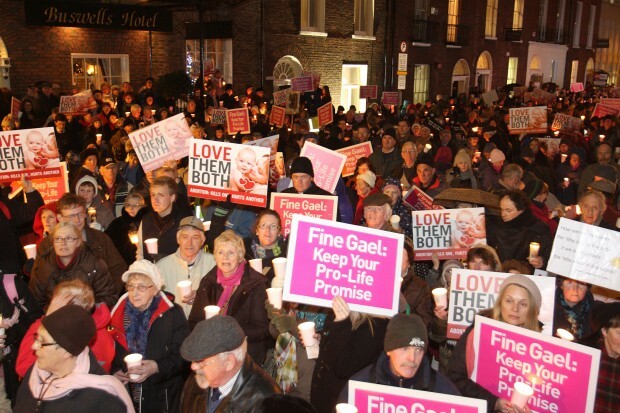 Those attending the vigil held placards saying “Fine Gael keep your pro-life promise” and “love them both,” referring to the mother and unborn child. In practice, abortion is illegal in Ireland. However, a 1992 Supreme Court judgment — known as the X case — found that there is a constitutional right to abortion where there is a substantial risk to the life of the mother, including the risk of suicide, up to birth.